Singer, songwriter, folk music collector, record producer, playwright, actor, Ewan MacColl was born Jimmie Miller, in Salford, Lancashire, England, on the 25th January, 1915. He played a vital role in initiating and extending what is now called the "folk song revival" in Britain. For sixty years, he was at the cultural forefront of numerous political struggles, producing plays, songs and scripts on the subjects of apartheid, fascism, industrial strife and human rights. He had a large impact on the North American folk music scene as well, not only through his songs but through the numerous articles he wrote on the subject for U.S. publications. The child of William Miller, a Scots iron-moulder and militant trade-unionist who was also a "sweet singer," and Betsy Hendry, his fit and fiery mate. Both were active left-wing socialists. William had left his native Stirlingshire in his mid-twenties. He met Betsy, one of 14 children from Perthshire, at a pawnshop in Falkirk, falling in love with the young red-haired manageress. William stumped around the country with Scots revolutionary John MacLean. As a result he was blacklisted in almost every foundry in Scotland. In 1910 the Millers moved to Salford in search of work. They had four children, but Jimmie is the only one who survived. He grew up amongst a community of emigre Scots. From his earliest days he was as familiar with the cut-and-thrust of political discussion as he was with the songs and stories his parents had brought from Scotland. His parents often entertained themselves and friends with their large repertoire of songs. In 1930, after an elementary education, Jimmie left school. It was the middle of the Great Depression, and he went directly into the ranks of the unemployed. Seeking warmth at the Manchester Public Library he began a life-long program of self-education. He found intermittent work as, among other things, a mechanic, factory worker, builders' laborer, and street singer. He joined the Workers' Theatre but found it too pedestrian and conservative and departed to form his own agit-prop street-performing group, the Red Megaphones. His next two decades were devoted to theatrical and political activities. In the early 1930s he wrote for and edited nine factory newspapers, writing satirical songs and political squibs. He also wrote advertising jingles for local restaurants. After taking part in the hunger marches and unemployed demonstrations of 1932-33, he joined forces in 1934 with Joan Littlewood, a young theatre student who had attended the Royal Academy of Dramatic Arts. They married and set up an experimental theatre in Manchester called the Theatre of Action. Jimmie played the lead role in Draw the Fires, produced by radical German dramatist Ernst Toller. In 1935 Joan and Jimmie moved to London where they formed a workers' dramatic school called the Theatre Workshop. The next year they returned to the north of England and founded the Theatre Union, which they modeled as a "theatre of the people." Jimmie and Joan produced Lope de Vega's Fuente Ovejuna, Jaroslav Hacek's The Good Soldier Schweik, and Jimmie's original script Last Edition. Called a "living newspaper," Last Edition dealt with the events leading up to the Munich Pact. This play employed an episodic form that Miller later used in his play Uranium 235. In 1939, the police raided a performance of Last Edition. Miller and Littlewood were arrested, charged with disturbing the peace, fined, and bound over (i.e., barred from taking part in theatrical activity)for the next two years. World War II temporarily disrupted the work of Theatre Union. Within weeks the members were scattered and serving in the war effort. They continued to correspond about theatre art and techniques, however, and when the war ended a number of them pooled their armed forces gratuities and launched Theatre Workshop, inspired by the work and thoughts of Miller and Littlewood. It was around this time that Jimmie Miller changed his name. Like many of Scottish descent, he was inspired by the Lallans poets of the 19th century who attempted to create a standard Scots language and literature to preserve their identity in the face of English dominance. These contemporary writers took the names of earlier writers and Jimmie took the name Ewan MacColl, a pseudonym which eventually usurped his given name. In an attempt to create a popular theater for the masses, Theatre Workshop traveled extensively from 1945-1952. Littlewood directed and produced while MacColl rehearsed the actors and wrote 11 new plays (many of them were translated and performed in German, French, Polish, and Russian). He often played leading roles in the performances as well. In his plays, Ewan experimented with language in an effort to close the gap between literary and oral traditions, stressing speech rhythms and cadences, constantly challenging his audiences. He used many of the same ideas and techniques in his songwriting and radio work. In the 1970s he would co-author (with Howard Goorney, one of the TW actors) a book of political plays and reminiscences about the Theatre Workshop entitled Agit-prop to Theatre Workshop. In the late 1940s Ewan and Joan Littlewood divorced. In 1949 he fell in love with and married the dancer Jean Newlove. They had two children, Hamish and Kirsty, both of whom became singers and musicians. Kirsty later established herself as a pop vocalist and songwriter. She placed a number of songs on U.K. charts over the years and was a backup singer on recordings by such top acts as Simple Minds, the Rolling Stones, Talking Heads, Robert Plant, Van Morrison, and Morrisey. When Theatre Workshop moved to London and became `fashionable', Ewan left and turned his attention to traditional music and song. In 1956 he met and fell in love with Peggy Seeger of the North American folksinging Seeger family. It was for her that he wrote "The First Time Ever I Saw Your Face", which many singers recorded during the 1960s until Roberta Flack's cover version took it to the top of the charts. It reached Number One in Billboard magazine the week of March 25, 1972, and stayed there for five more weeks. In the Grammy voting for 1972, Flack received the award for Record of the Year while MacColl accepted the trophy for Song of the Year. In England, the song also won an Ivor Novello Lyndon: note the spelling!) Award in 1973. 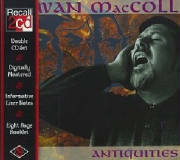 MacColl wrote an estimated 300 songs, many of them created for theatrical or media-oriented programs. Among his best known songs are "Dirty Old Town" about his childhood town of Salford, "The Shoals of Herring," "Freeborn Man," "My Old Man," "The Thirty-Foot Trailer," "The Manchester Rambler." 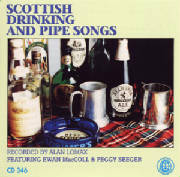 Many of these songs were born out of MacColl's work in folk clubs. In 1953 Ewan and such notable folk stalwarts as Alan Lomax, Bert Lloyd and uillean piper Seamus Ennis founded the Ballads and Blues Club, later known as the Singers Club. The latter club launched the careers of many young singers and groups until it closed in 1991. Ewan sang there regularly until just a week before his death. 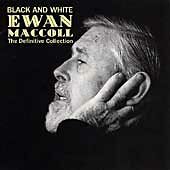 Ewan MacColl's involvement with the media was a constant thread throughout his life. Beginning in the early 1930s, he worked in radio as a narrator, actor, writer and producer, collaborating with experimental producers such as D.G. Bridson, Dennis Mitchell, and John Pudney. When he was only 19, the BBC commissioned him to prepare a program called Music in the Streets. In 1957 he collaborated with Peggy and BBC producer Charles Parker on a series of musical documentaries for BBC radio which came to be known as Radio Ballads. These represented a major breakthrough in radio techniques, featuring a combination of recorded speech, sound effects, new songs and folk instrumentation. As noted in Sing Out! magazine in November 1964, the series "provided new dimensions in folk music broadcasts. . . .We have nothing comparable here. They are usually hour-long programs combining documentary recording and interviews with contemporary ballads created in traditional forms . . . [on subjects including] `Boxing'. . . `Gypsies and Tinkers' and `Teen Agers'." The eight Radio Ballads in the series are being issued by Topic Records in 1999. By the late 1950s, MacColl and Littlewood had were no longer working as a team in theatre. 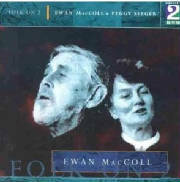 MacColl's marriage with Jean Newlove had split up and Peggy and Ewan were joined both in personal and public life, becoming well known as a singing duo. They toured in Britain and abroad as singers of traditional and contemporary songs from 1957-1989. Between 1959 and 1972, they had three children: Neill and Calum (both musicians) and Kitty (who works in desk-top publishing and public relations). They gave concerts, conducted workshops and toured widely, singing traditional and contemporary songs. They wrote scripts and music for films and commercial television shows. Their involvement in and influence upon both theory and practice in the British folk revival was legendary. From the late 1950s through the 1980s, MacColl was a prolific recording artist completing dozens of albums of traditional and contemporary songs both as a soloist and with other artists, mainly Peggy. His (and their) LPs came out on such labels as Decca, Topic, Argo, EMI, Riverside, Rounder, Tradition, Stinson, Folk Lyric, and Folkways. Seeger and MacColl also formed their own recording company (Blackthorne Records). Among their recorded works were The Long Harvest (a ten-volume series of traditional ballads), The Paper Stage (a two-volume set of Shakespearean sung narratives) and Blood and Roses (a five-volume set of rare British and North American ballads). A complete discography may be found on Peggy Seeger's website (www. pegseeger.com). In 1965 they founded the Critics Group, a cooperative company of revival singers interested in studying and combining folksinging and theatre techniques. From 1965 to 1971 Ewan wrote an annual musical stage documentary called The Festival of Fools, a dramatic musical revue of the year's news performed by the Critics Group. Seeger and MacColl were avid folksong collectors, chiefly among gypsies and travellers in Britain. They produced two anthologies: Travellers' Songs of England and Scotland and Doomsday in the Afternoon., a profile of the Stewarts of Blairgowrie, a singing family of Scots travellers. In 1979 Ewan suffered the first of many heart attacks. Nevertheless he continued to work, tour, lecture and write songs. In 1980 he wrote his last play, The Shipmaster, a story of a sailing ship captain who cannot adapt to the coming of steam. It was in many ways analogous to his personal and professional life as his health was deteriorating. In 1987 he began writing his autobiography, Journeyman, which he completed a year later. On October 22, 1989, he died of complications following a heart operation.